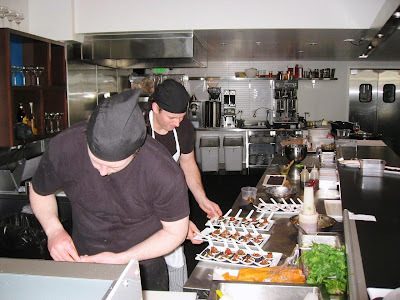 It was therefore with much anticipation that I stepped into the delightful La Mar, a playful but sophisticated restaurant right on San Francisco Bay. With splendid views of the waterfront, this restaurant is a showcase of Gastón Acurio, the most famous chef of his country. Peruvian cuisine draws on a fusion of indigenous traditions and the influence of immigrants from Italy, Spain, China and Japan. While this restaurant is known for its excellent ceviches, the menu also has a variety of starters, entrees and traditional rice dishes. I took a seat at the long ceviche bar. It was only a few minutes since the restaurant opened for the evening, but the large dining room was already filling up fast. Behind the bar, I could see activity begin to peak, as orders for ceviches and tiraditos - Peruvian sashimi dishes - streamed in from the waiters. While I browsed through the menu, my waiter put a basket of banana chips in front of me. 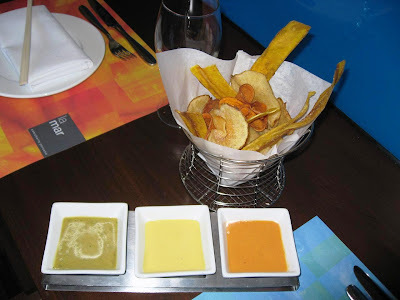 There were chips of ripe and unripe plantains in the mix, which enhanced the taste; the three dips were excellent too. My waiter was a friendly chap; he checked to see if I had eaten Peruvian food before, explained the various options, and was on hand whenever I needed him. 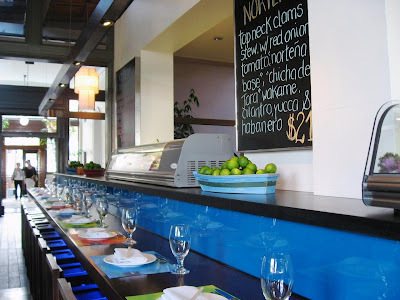 The ceviche is clearly La Mar's signature dish and they have a range of options to choose from. 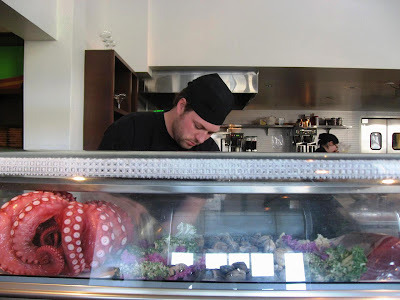 Variations include Mahi Mahi, calamari, octopus, California halibut, Ahi Tuna. Some sprinkled with scallions, ginger and peanuts, others studded with red onions, cilantro and oversize kernels of Peruvian corn. All are fresh and piquant, some really hot, and all are briefly marinated in a flash acid bath of leche de tigre, a lime-and-chili marinade - also described as an aphrodisiac! 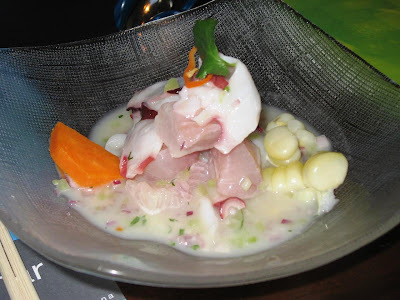 I decided to start with the day's special ceviche, the Cebiche Carretillero made of halibut, Japanese octopus, squid, red onions, celery, ginger, garlic, very spicy habanero chilli and kernels of corn in leche de tigre. The ceviche was delectable and kept my taste-buds tingling throughout. The acidity of the leche de tigre and the heat of the habanero in the medley of fresh sea-food was a complete delight. I decided to choose from the Causas next. These are traditional Peruvian potato dishes where potato is boiled, mashed and whipped before being mixed with aji amarillo - another of their many chilli peppers - and topped with seafood or vegetables. 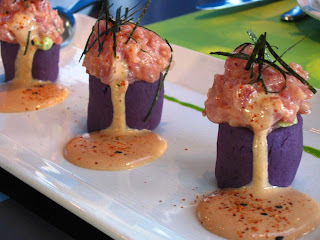 Interestingly, the Causas was made of purple potatoes which I didn't know existed. 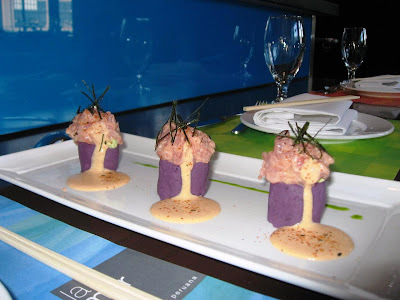 I chose the Causa Nikei which had Ahi Tuna, Nikei sauce, avocado puree, creamy aji amarillo and rocoto Huancaina suace. I loved the presentation - the purple potatoes make for a nice picture! This Japanese influence of the topping mingled with the heat of the chilli pepper in the sauce made a lethal combination. While there was a bit too much potato in the dish (some of which I had to leave uneaten), the toppings were gratifying. Given the size of the portions here, I now only had space for Anticuchos, traditional skewers of meat and vegetables. I chose the Arroz Con Pollo: grilled chicken breast and vegetables over rice cooked in cilantro, aji amarillo and beer. The chicken was very flavorful, smokey, and just what I needed to end this unique meal. 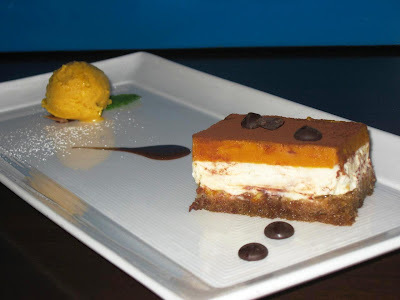 At the waiter's recommendation, I decided to taste the lucuma Tiramisu with lucuma ice cream. Lucuma is a sub-tropical fruit from the Andes, with a rather intense and unique flavor. I liked it! Another popular dessert on the menu you may want to try is the Orange glazed chocolate beignets with banana and passion fruit ice cream. 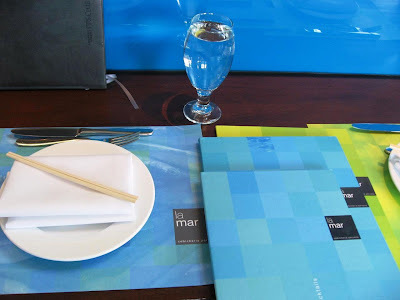 In a nod to Peru's rich culinary heritage, La Mar has a traditional pisco bar and lounge which front The Embarcadero. Pisco dates back to the 16th century and is made from distilled grapes, often of one variety, then aged for a minimum of three months. 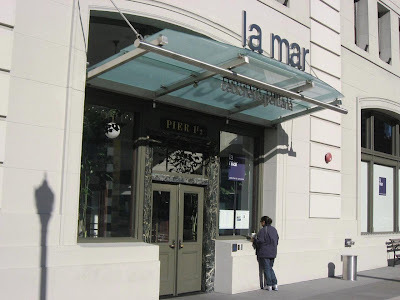 La Mar offers more than ten specialty drinks made with pisco, including the classic Pisco Sour and Pisco Punch, which originated here in San Francisco. 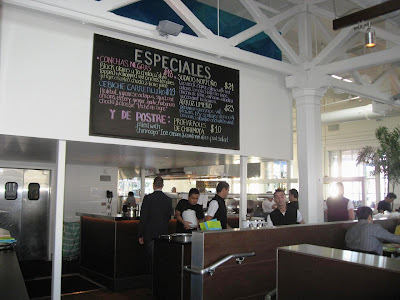 I hope to be back here again - to try the tiraditos, arroces and some of their other interesting meat and seafood entrees. 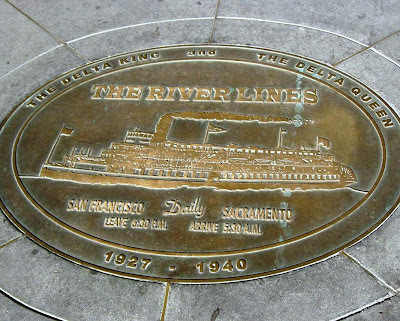 La Mar is located on the waterfront at the landmark Pier 1½, formerly the passenger waiting room for the Delta King and Delta Queen. The large dining room can accommodate 80 diners. They also have a 38-seat lounge with fabulous views of the Bay. I'll be visiting Peru in May. I like the way you've described the Peruvian food served in SF..yummy Ceviche! @Blue Bike: In today's world where everything is available everywhere, it feels wonderful to discover something new. @indicaspecies: Ceviche certainly is yummy; I am amazed I discovered this dish only recently. @A New Beginning: Thank you! Purple potatoes! Now that is a treat. And as you have said, they make a great picture. 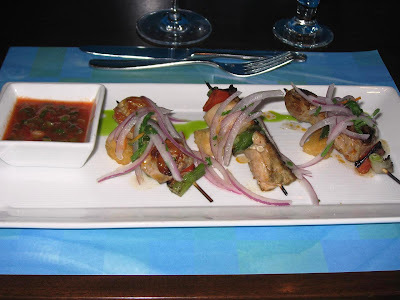 Food is good in Peru, lots of fish and sea food. They like fusion food too, especially with Chinese food. @Zhu: I am only beginning to discover their food. You must have tried the real thing during your recent South American vacation. Will send this to my friends in SF. Would have loved to have discovered ur blog when we lived there. @Vamsee: SF has so many places to eat, I love that city! @Derek: Thank you for all this information!